This article is about the voice actor. For the Futurama character he portrays, see Al Gore's head. 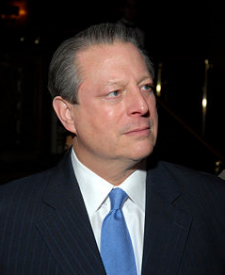 Albert Arnold "Al" Gore, Jr. was the 45th Vice President of the United States under Bill Clinton. After losing the election in 2000, he became a prominent advocate against global warming, a passion he pursued even before taking office as vice president. Already during season 1 of Futurama, Al Gore commented that he considered Futurama to be "his favourite show". It would seem no surprise that he was willing to lend his voice in "Anthology of Interest I" in season 2 to provide the voice of himself. He returned in "Crimes of the Hot" in season 4, an episode focusing on his passion, global warming. When Futurama was renewed for four films, Gore returned to lend his voice in Bender's Big Score, and he appeared in the season-6 episode "The Futurama Holiday Spectacular". His daughter Kristin was a writer on Futurama during season 3 and season 4, and was lead writer on "Leela's Homeworld". In the credits for "Anthology of Interest I", he is listed as "Vice President Al Gore". All other times, he is just "Al Gore". 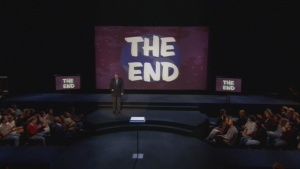 Al Gore's 2006 documentary movie An Inconvenient Truth had a Futurama-style trailer. On a related note, the movie An Inconvenient Truth has a clip from the episode "Crimes of the Hot", where they drop giant ice cubes into the ocean. See also in popular culture. This page was last edited on 31 March 2014, at 21:22.